You’ve retired, or just packed in work, or moved to a new area: your life has changed. In some ways so much better, but in others not so good: you just don’t get to see as many people these days. You’ve no interest in night clubs or bars, you’re not really that bothered about a “love interest”, and you’re shy of clubs and societies. But a few more friends to chat with about common interests would be nice. Trouble is, the less you see of people the harder it is when you do see them. But have you forgotten your dog? Being out and about with your dog is a great way to start casual conversations with people who have at least one common interest. It’s a surefire way of filtering out all those who don’t like dogs: they won’t want to go near you! And before you say, "But my dog's not friendly," you can still follow a number of these suggestions with success. 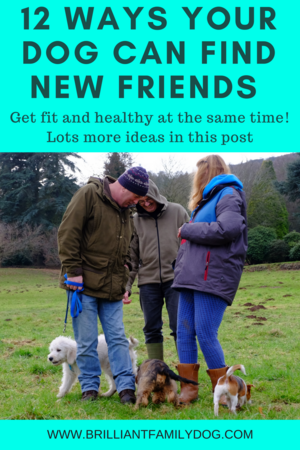 You may find some very understanding new friends who have similar issues with their own dog - you can help each other to improve your dogs together! Let's find some new friends! 1. Lots of people love puppies. If you’re in the happy position of having a puppy you’re away! This fits in nicely with the fact that your puppy should be going out from the day you get him, to meet as many people as possible, and see lots of dogs and other things in our world. Need to know more about this? Check out this post. If your dog hasn’t seen puppyhood for a good while, you may get away with calling her “Puppy” and provoking some Oohs and Aahs. People who can see she’s actually 7 years old will just consider you a little eccentric - which is attractive to many people, so no loss there. 2. Visit the Vet’s. There are vets, vet nurses and vet techs, and other pet-owners in the waiting room. You don’t have to be suffering from Munchausen By Proxy Syndrome - your dog doesn’t have to be sick! You can drop in to fix up for wormers or vaccination boosters - or just ask to weigh your dog on the scales or check their displays of toys. Here's a post to enjoy a good vet visit with your dog. 3. Take your dog and a book or e-reader to the Cafe. As I love coffee shops this is one of my favourite dog outings. Teach your dog to switch off and be calm on a mat and you can take him and his mat everywhere, reliably, along with some chews and other such doggy entertainment. If you’re open to it, you’ll hear people’s life stories over your coffee. 4. Walk in popular places in town as well as the country. (Essential for puppies) This works very well if you have a pretty dog. Your dog isn’t pretty? How about some ribbons on her collar, or some sparkly stars on his lead, or a pretty jumper for the cold weather? Look friendly and hang around as if waiting for someone and people will approach your dog and you. 5. Perform tricks in popular places. Instead of wasting your time sunbathing on the beach, teach your dog some tricks there. These can be very simple, like “Give me a hug” - sitting with both paws on your leg, or “Say Hi” - waving a paw. You’ll get a genuinely appreciative audience. And the funny thing is that they’ll think your dog is so clever - they won’t twig that it’s you who was clever enough to teach him! 6. The dog park: if your dog comes reliably every time he’s called (hint: you can teach this!) people will admire you and want to talk to you to find out how it’s done. Walk in exciting new places. If you hit the trails with your dog in all weathers, you’ll find others who love the great outdoors - with or without dogs. 7. Passing the local school on your walks. This is essential if you have a puppy - they have to get used to children shrieking and running. Your older dog needs to be child-friendly, of course. PC Warning: Gentlemen - take care! Probably only do this if you are a woman or have children with you. Meeting the local police is not on your agenda! 8. Dog classes: be sure to choose force-free classes that are dog-friendly. That may sound batty to you - looking for a dog-friendly dog training class - but sadly lots of classes are not in the least dog-friendly (and some of them aren’t people-friendly either!). So do some research first - if they don’t let you visit to watch, move on. There’s no need to treat your dog any differently than you would treat a three-year-old child, so there’s no room for nasty devices, shouting, intimidation, "dominance", being the pack leader, and other such nonsense. You’ll find other like-minded people there, who also love their dogs and don’t feel they have to boss them around to feel big themselves. 9. Other dog walkers: you can fall into step with them for a few yards and see if you’d like to know them better. If you’ve gone through everyone who walks at your usual walk time, try another time or place and you’ll find a whole lot more people and dogs! 10. In the pet store. Nice outing for your dog to sniff all the toys and choose one, get up close to hamsters and budgerigars (as long as he’s not frightening them) and check out the cat toy section to find out what makes them tick. 11. The groomer, for fuzzy dog owners. Even better - the grooming class at your local education institute: lots of fellow students with similarly fuzzy dogs, and a cafeteria at break time where you can get to swap phone numbers for companionable fuzzy walks. 12. Take up a dog sport - there’s Dancing Dogs (hey, guys, some of the best-ever Dog Freestylers are men! ), Cani-cross - cross-country running (or walking) with your dog, Rally, Skijoring, Agility, Flyball, Nosework and Tracking, Search and Rescue, Earth Dogs (tunnelling for terriers), Lure Coursing (for speed kings). Or you could help people in hospitals and institutions by training your dog as a Pets as Therapy (PAT) dog. Some of these activities are fiercely competitive, some just for fun, and some are a help to the community and will earn you great respect.